I found a bunch of basil leaves this afternoon which is left on my refrigerator for long time. I got them for preparing basil pesto and totally forgot them. OK, let me use this for lunch before it spoils completely. 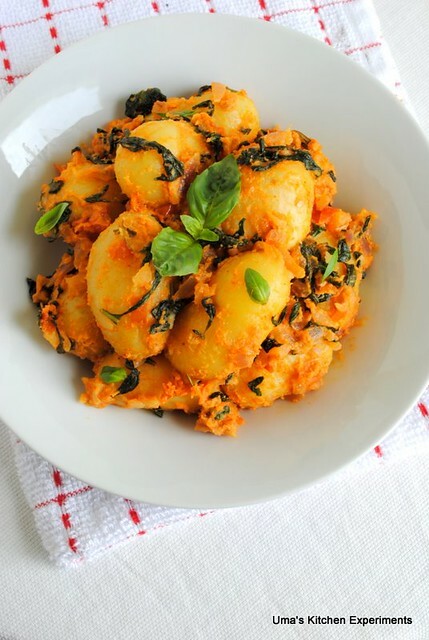 For lunch, I prepared our usually baby potato stir fry and just added basil leaves with them. I feel potato is the one which accompany with anything edible. The stir fry was flavourful and tasty with basil. Basil leaves what we get in India looks little different and very strong in taste and fragrant. Here, It is widely used for medicinal use(Tulsi Kashayam) than the culinary purposes. I remember eating the fresh holy basil leaves given in temples of India which is said for giving strength, relieves stress and body pain. There are many varieties of basil depends on geographic which are also differ in appearance and taste. See here, for additional list of basil cultivates. I used here the sweet basil variety for the stir fry. 1) Pressure cook the baby potatoes. Prick them using fork without breaking and keep aside. 2) Add chopped onion and ginger. Saute till onion becomes translucent. 3) Add tomato and continue sauteing till it mashes well. 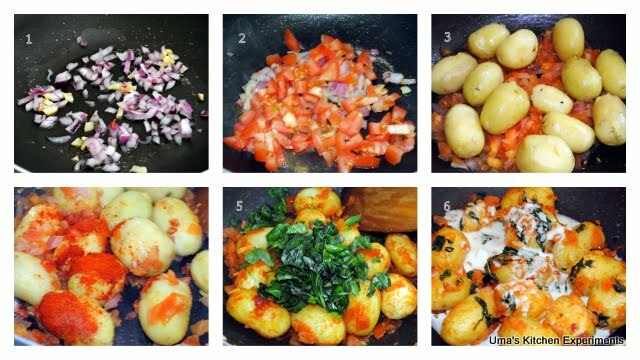 4) Add baby potatoes followed by red chilli powder, turmeric powder and salt. 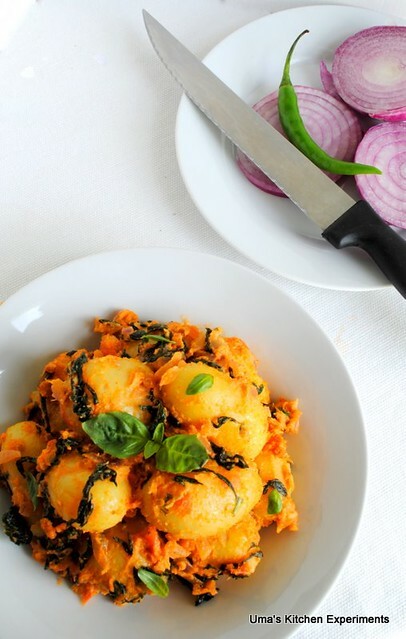 5) Toss them till masala coats the potatoes and fry for a minute. 6) Add chopped basil leaves. Toss well and cook till basil leaves are soft. 7) Add coconut milk and give a stir. Cover and cook for 10 minutes or till the coconut milk completely evaporates. 8) Stir and cook uncovered for two minutes and remove from heat. 9) Serve hot with rice or roti. Such an aromatic, flavorful stir fry..a simple stir fry with new blend of ings!!!! Deeelicious!!! wow coconut milks shd hv made thos taste heavenly..
wat a aromatic n tastee sabzi....adding coconut milk really gives nice taste n richness to the fry....love the recipe...very nice presentation n superb clicks Uma!!! I like ur version.. nice idea using coconut milk.. lovely clicks.. Tempting flavorful recipe dear....yummy...beautiful clicks..
a blend of nice flavours in this wonderful recipe, looks lovely..
delicious fry !! very tempting clicks !! Stir fry looks so flavor and delicious. Beautiful aromatic stir fry, I know it will taste delicious. Looks so inviting and catchy colours.. Ummm...I love the color of the baby potatoes! Addition of basil is wonderful! !